Epoxy Paint or Epoxy Coating; Do you Know the Difference? There is an abundance of confusion today from homeowners looking to apply and epoxy coating to their garage floor. Should it be epoxy paint or an epoxy coating? Is there a difference? If so, which is best? The easiest way to figure this out is to learn the difference between paint, epoxy paint, and epoxy coatings, in order to eliminate all the confusion and be able to make an informed decision. The first misnomer that we want to address is that an epoxy coating is not paint. Garage floor paint is a latex acrylic product. Many of the well-known paint manufactures do offer paint with a small amount of epoxy in the mix and refer to them as 1-Part epoxy paint. This allows for better adhesion and durability than standard acrylic paint, but it is not an epoxy product. The term “epoxy paint” came about when epoxy manufactures took notice of the terminology that people were using when searching for epoxy coatings. The DIY public was intermixing the term “paint” with “coating”. So a marketing decision was made and many well known DIY epoxy flooring manufacturers that you see in home improvement centers decided to brand their products as “epoxy paint” since that is what consumers seemed to be calling it. As a result, it has only made things more confusing for the consumer. Chances are that when you see something advertised as epoxy paint for your garage, it could be acrylic paint or it could be an epoxy coating. This has led to many people buying a paint for their garage floor when what they thought they were purchasing was an epoxy coating. Epoxy is a two component product consisting of one part epoxy resin and one part polyamine hardener. You are required to mix the two parts together prior to application. After mixing you are limited by time and temperature as to how long you have to apply it. With colored epoxies it is the resin that is tinted to give the epoxy color. If it’s not tinted, then it goes on as a clear coating. Epoxy coatings cure and do not dry like paint does. Unlike paint, the mixing of the two components starts a reactive process that creates cross-linking of the components while it cures. This cross-linking provides a very hard and durable surface that seals the concrete and is resistant to staining, abrasion, and chemicals. The amount of resistance and performance of the coating is usually determined by the quality and solids content of the epoxy. The ease of application and thickness of the epoxy is also dependent on the volume of solids content. This is always displayed as a percentage. In other words, 100% solids epoxy means that you have 100% of the product on the floor after it cures. 50% solids mean that you will have 50% of the product remaining on the floor after it has cured. The reason for this is that the carrier agents (water or solvents) which are used in the lower solids product evaporate out as the epoxy cures. As an example, a 100% solids epoxy applied with a roller has an approximate wet film thickness (WFT) of 10 mils. Once it cures, the dry film thickness (DFT) remains at 10 mils. A 50% solids epoxy will have a wet film thickness of approximately 6 mils. Once it cures, the coating is reduced to a dry film thickness of 3 mils. 100% solids epoxy is harder to work with during application because of the thicker viscosity and limited time to apply it. Epoxy with a lesser solids content has less viscosity and is easier to apply. Many of the inexpensive “DIY” epoxy paint kits that you can buy at the local home improvement centers and online have as little as 48% solids. This means that it is easier to apply as well as cheaper to buy because the solids content is much lower along with the quality. It goes on the floor almost as easy as paint does. In fact, easy application it is one of the primary marketing points that makes these kits so popular to purchase. They can be applied to your garage floor more easily compared to the more premium epoxy coat systems. Keep in mind that this also means you have much less of it on the garage floor resulting in a much thinner coat. This affects the performance and durability of the coating when compared to epoxy brands with a higher solids content. Does this mean that these epoxy paint kits are bad? No, it just means that you are getting what you pay for. Many of these kits cost under $70 and cover up to 250ft². Two kits will cover a typical two-car garage. They are usually available in either grey or beige with a semi-gloss finish and include a small bag of paint chips to add if you like. The more expensive kits tend to be marketed as epoxy coatings, though there are some exceptions. They come in multiple colors, have a higher solids content, and result in a thicker, more durable surface that lasts years longer. When ever in doubt about what you are purchasing, always review the TDS sheets. These will detail exactly what type of product you are purchasing as well as other very important information regarding application and durability. So don’t fall for the epoxy marketing name game when deciding on what you want to apply to your garage floor. As you can see, epoxy paint and epoxy coating generally mean the same thing. They are both an epoxy coating. Do your research first, as this will help you to understand the type of epoxy you are purchasing and what kind of results to expect. Floor epoxy and wood epoxy ,are they the same or they are different? Hello HJ. Wood epoxy is formulated different than epoxy used for concrete floor coatings. Some concrete coatings can be used on wood, but epoxy for wood should not be used as a floor coating. It would be much more expensive to apply and the abrasion characteristics are different for starters. Is epoxy fire proof paint?? Hello Dharmendra. Epoxy is not paint. This article explains the difference between epoxy and paint. Epoxy formulations can be obtained that are fire resistant, but not fire proof. Hello Joshua. The Behr 1-part epoxy paint is just latex paint. It has a little bit of epoxy added to aid in adhesion and wear, but that’s it. I’m not sure what you applied before, but it could not have been epoxy. Epoxy requires that you mix the resin (part-A) with a catalyst (part-B) in order for it to react and cure. Also, if exposed outdoors it will amber (turn yellow) and even begin to chalk. You may want to check with one of the vendors that offer a single-part polyurea. We have an article here with links to them. Single-part polyurea can take U.V. light and outdoor exposure. You may be limited by color selection though. I’m restoring some antique encaustic (concrete/clay-based) tiles. I need to fill in some larger chips/flakes around the edges created while they were salvaged. Having used epoxy fillers for other projects, I believe that will work to fill in divots, but I’d like to find small quanities of epoxy paints in primary colors plus white, black, & brown. Do you know of any brand or source? The tiles are floor tiles. Hello PJC. We are not aware of anyone who sells such a product in colors like that. Epoxy requires the mixing of a part-A resin and part-B catalyst (hardener) in order to activate. What you may be able to do is purchase small sizes such as these from Hobby Lobby or equivalent hobby shop. You can choose the 5 minute fast cure or longer 30 minute cure. You can then tint the part-A resin with something like this. Keep in mind that clear epoxy is not water clear. It actually has a yellow tint to it. So you need to keep that in mind when tinting for color. Hello, are all epoxy coatings inherently glossy? Or are there any available with matte/flat finishes? Thanks! Hello JD. Most epoxy floor coatings are gloss to semi gloss. However, there are some polyurethane clear coatings that you can apply to epoxy that are matte in finish. This would tone down the gloss. We suggest you contact ArmorPoxy and tell them you are looking for a matte finish floor coating and see what they can do for you. They supply many large commercial flooring contractors across the U.S. and may have what you need. Hello and I have a Question. I live in our old 60 year old home. We were in a Hurricane that caused flooding to 3 feet inside our home. We were about to pull up the entire kitchen floor and replace it with thick plywood. Come to find out after pulling the main floor off, we had the most beautiful Oak Planks. So we decided to keep those and we did sand them, put polyurethane over them. But, there are pieces that are sticking up and they can be bad on the feet. Also, there are some wide spaces where the planks don’t meet. I was wondering if I could put the epoxy over the floor to cover up the nails that stick up, but mainly the splintering wood? Hello Shelli. Epoxy should not be used for repairing real wood floors. It will not fill gaps in the wood either. If the floor was sanded properly you should not have edges of boards sticking up. Splinters that stick up just above the surface should be repaired by inserting carpenters glue under the splinter and then press it back in place. Hold it down for 12-24 hours with strong tape or a heavy object with a flat bottom. Any nails that are sticking up should gently be pounded into the wood just below the surface using a punch. Any remaining cavities in the wood (including where nails are) should be filled with wood putty. Once the glue and putty has dried sufficiently, sand and then apply the polyurethane. Hi! We are building a steel home on a concrete slab foundation. The home is quite large for a single level @ 4,320 sq ft. We are a multigenerational family, with 11 residents in the home…we live in the country, have a small farm, and two of our kiddos have special needs…our floors are going to take a beating! However, we do not have the $12k-$15k we are being quoted for an epoxy finish. Do you think it would be possible for us, as a family, to do a project this big? Room by room, of course. The most challenging room would be the kitchen/dining/ great room combo…27’x36’. Any recommendations? Hello Bren. It can be done, but you will have to take in some considerations before you do. Proper concrete prep is important for floor coatings. It requires profiling the surface, which in your case would require grinding in most circumstances. You can’t acid etch inside the home. Also, some products will produce VOC’s when first applied, but they will rapidly dissipate within 24 hours. This isn’t really an issue if no one is residing within the building yet, but it can be if there is. We suggest contacting ArmorPoxy and speak with them about your desired project. They are a very large floor coating supplier and contractor with an extensive line of product. They are very helpful and can make some recommendations based on your requirements. Depending on product, you should easily be able to complete your floors for 1/3 of what you are being quoted. Can I use epoxy flooring on the walls (plaster finished), and what is the steps to do it on the walls? it needs a potty or primer enough? Hello Tarek. No, epoxy is not designed as a wall coating and will not adhere well to plaster. Also, due to the slow cure times and thickness of the coating, it can begin to run when applied to such a smooth surface. Thank you dear for your clarification, and is there a special kind for using on the plaster? No there is not, Tarek. Epoxy coatings are not designed for plaster walls and you will not find anyone who sells epoxy for such. Can 2-part epoxy be applied on an already existing epoxy coating on concrete floor? Yes it can, Ajit. This article explains how. I recently used Behr Granite Grip on my garage floor. I prepped the floor correctly removing any oil/grease stains. I then used an acid wash to etch the surface. After the floor dried i tested a few spots to verify that water was absorbed into the cement and not beading. I also let the product sit for a week after applying it before driving on it. My question is …can i apply epoxy 2 part system over the top of this paint to prevent water from penetrating the painted surface. Hello Mike. Did you do a moisture test before you applied the paint? Water bubbles under paint or a coating is a big sign of moisture that has migrated up through the slab to the underside of a coating. If you don’t have a moisture issue you can apply an actual epoxy coating. However, paint and epoxy are not very compatible. You will want to remove the paint first since paint does not adhere well to concrete and makes for a poor base. Hi, I’ve seen rubber-like applications in children’s playparks in the UK. Wondered if this is also epoxy..?! Hi Grace. No, it’s not epoxy. Epoxy cures to a very hard coating that is not flexible at all. We have an older home built in the 1930s and would like to update our basement floors with epoxy. The original concrete was not poured as smooth and flat as new homes so has some “rolling” areas. There are also some patched areas where a new furnace was installed, new drain pipes replaced, etc. We’ve gotten a few quotes from companies to come do the work. One company advised against epoxy suggesting that the concrete was probably ready to be replaced – suggested polishing instead. This made me wonder if applying epoxy on older concrete would compromise it in some way. Another company would clean up/prep our basement concrete and apply a “breathable” epoxy since there is no vapor barrier under the concrete like in newer houses. We have no water coming into the basement and have no structural cracks in the floor. Do you have any thoughts about applying breathable epoxy to concrete that 90 years old. Hi Kathy. I would stay away from the company that recommends polishing. If they stated that the concrete was ready to be replaced, then no amount of polishing is going to fix that. Regardless, polished concrete is not a good option for a basement. There is something funny going on there. The company that recommends a special breathable epoxy is right on the money and would be a more trusted source. Ask if they do a moisture test before performing any work. Although your basement may not be wet, moisture vapor can still be coming up from beneath the slab. As long as it’s not too much vapor the breathable epoxy will allow it to pass and not hinder the coating. Ask about the concrete prep they do as well. Grinding is the preferred method and helps to smooth out and hide all the transitions where the concrete has been repaired or replaced in the past. Make sure that all work, including prep and materials, is put down in writing. Hello Devi. Epoxy-Coat is a highly durable 2-part resinous coating while the Epoxy-Seal is a latex paint. They are not compatible, they cannot be mixed together, nor can one be applied on top of the other. This article here explains the difference. Hi 🙂 Can you epoxy over the Behr Garage and Floor Paint in a small space (say a bathroom) to seal it and prevent excessive wear/flaking where furniture rests/rubs on the painted surface? Hello Deedee. Paint is not designed to be clear coated and is not compatible with most actual coatings. The solvents in these coatings will soften the paint and bleed through during application. The only actual coating you can apply is a water based epoxy coating. Valspar clear epoxy is one of the few lesser expensive examples. The water-based coating will not soften the paint. It will require that you rough up the surface of the paint with 120 grit sandpaper first in order to provide the mechanical grip necessary for the epoxy. An easier solution would be a clear acrylic sealer. These do OK and will not require that you sand the paint first. They will provide a clear glossy look and lock in the paint chips. These type of clears are designed for certain paints and masonry, but they are not a tough coating like epoxy. They work best for foot traffic only. This is an example from Behr. Hi, thanks. Great info. I’m (re)doing my basement slab floor. I had it ground down, I thoroughly cleaned it, filled all cracks and then did a layer of “drylok clear” on the basement floor to reduce moisture intrusion. Now I want to do an epoxy coat. What do you recommend? It’s about 350 sq ft. I want to more than just a low solids epoxy paint such as drylok E1. Any advice hugely appreciated. Hello Kevin. There are a few issues with applying an epoxy coating to your basement floor. The first is that you applied the Drylok Clear. Epoxy should be applied to properly prepared bare concrete. Drylok Clear is essentially a water based acrylic coating. It’s a breathable clear coating that seals the top surface from moisture (spills and such) and still allows for moisture vapor from below the slab to escape through the coating to the surface. This is what helps to prevent the coating from delaminating and is the reason it does well in basements. Epoxy on the other hand is not breathable and seals out both moisture and vapor on both sides. If you have any moisture in your basement floor, it will eventually cause the epoxy to peel. Also, the only type of epoxy you can apply to an acrylic coating is water-based epoxy. Other epoxy (except 100% solids) and similar coatings have solvents which will soften the acrylic clear coating. It will require that you degloss and roughen the finish with 120 grit sandpaper before installation. Also, water-based epoxy has a semi-gloss finish and is not as glossy as other coatings (if that is a concern for you). Additionally, the epoxy can peel up easier if your basement has moisture. This is due to the fact that the epoxy is actually adhered to the acrylic coating and not the concrete. If your basement has never had any issues with moisture or dampness, then you can install a higher quality coating. However, it will require that you remove the acrylic coating first. Thank you Shea for this clarity. I will go with a water based epoxy coat so and see how that goes. I’ll stay within the Drylok family for simplicity and use their E1. Just to make sure you are clear on things, Kevin, Drylok is not epoxy nor is it a true coating. It’s an acrylic latex paint that is fortified with a little bit of epoxy resin mixed into the paint. That is why it’s called a 1-part epoxy paint. ahh, OK thanks again Shea. Is there a product you could please recommend instead? Meaning a water based (non solvent) epoxy (I don’t want to have to degloss and roughen the floor again) that I can apply on top. Sincere thanks. Hi Kevin. You can use any brand of water-based epoxy. EpoxyShield by Rust-Oleum is an example. However, there isn’t any epoxy that you can apply on top without deglossing and sanding it first. It needs the mechanical bite to adhere or it will peel. Just keep in mind that it will not adhere as well as epoxy does to bare concrete. The clear Drylok is what is keeping everything bonded to the floor. I have too much stuff in my garage! That being said I’d like to do a two part approach to the floor. What product would be best for that? Basically so I can clear one side, apply the paint or epoxy coating, then move the stuff back and do the other side. Thx. Hello Mike. 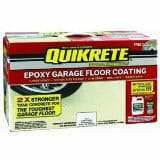 Do you have contraction joints in the garage floor? If so, you can use those as a natural border and then use any product that you want. If you don’t have those joints, then you are limited to garage floor paint or a 1-part epoxy paint. 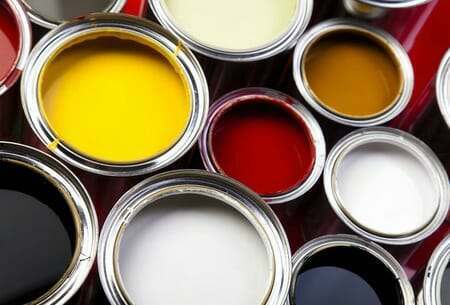 The reason is that regular paint blends well when one coating overlaps another – similar to paint on a wall. Epoxy and other coatings do not blend in that manner. It’s very obvious where one coat overlaps and rolls over another. The problem with concrete paint and 1-part epoxy paint, however, is that it does not hold up very well in a garage unless it’s mostly foot traffic. Thanks it is mostly foot traffic. I’m also concerned with moisture issues so was leaning towards paint or one part epoxy. Just curious, I suspect the bonding is better in higher temperatures? Was planning to do it in higher temps or have a couple of portable heaters running. Paint and 1-part epoxy paint is breathable and will do better will moisture vapor. The bonding will not be any better or worse as long as it is applied within the temperatures specified in the data sheets for the product you choose. Thanks for all the help Shea. I really learned a lot from this site! I’m leaning towards a UGL 1 Part Epoxy Platinum Color. I was curious… If I do two coats what is the best strategy for adding flakes? Is it better to add them with the first or second coat? Also… I did see a sample of the Epoxyshield Metallic at my local retailer. Very impressive looking! I really liked the red color options. My question… I get heavy sunlight certain times of the year. I saw on the Mother Daughter video they had some issues with UV and had to apply a different type of coat at the front of the garage. Is the UV thing still an issue with the Polycuramine? Hi Mike. You always add color flakes to the last color coat. Just keep in mind that you cannot apply a clear coat over the color flakes of 1-part epoxy paint if that was your plan. Yes, the polycuramine by Rust-Oleum and RockSolid (same product different label) are not U.V. stable and will amber from direct sunlight. Right, I wasn’t thinking clearly when I asked about the flakes. Logically on the second coat since you are covering the first coat (in my case with a 1 part epoxy not a clear coat). I’ve started my prep work and I’m really floored no pun intended by the extent of my moisture problem. I may need to grind rather than etch. You had mentioned paint or 1 part epoxy for my sectional approach, any thoughts on the moisture issue as far as paint vs epoxy? Really concerned about what the moisture will do to the epoxy over a multi year period and was starting to think a paint and periodic repaint might even be better. Thanks..
Grinding vs etching has no bearing on a moisture issue, Mike. If you feel that it’s worse than you thought, then you may need to take a step back and re-evaluate things and consider other options. Remember, 1-part epoxy paint and concrete paint are essentially the same. They are both a latex acrylic paint that is breathable. However, both will still peel right up if you are getting visible moisture at the surface. They do OK with moisture vapor, but not visible moisture. An epoxy coating is a definite no go when moisture is present. One option would be to treat the concrete with a densifier to help slow down moisture intrusion and then consider something like interlocking tiles. Shea- reading through some of the comments. If you’ve applied a 1 part epoxy and want a glossier look… the option is to cover with an acrylic sealer? The 1 part epoxy really does seem to be more like a paint. It definitely shows imperfections and I’ll be surprised if I can get flakes to adhere on the 2nd coat. No regrets though, it’s an improvement over standard concrete. And kind of a fun learning project. You are correct on both counts, Mike. 1-part epoxy is acrylic latex paint with a small amount of epoxy resin added. It does not have the same properties of a true 2-part epoxy coating. A water-based acrylic clear coat is about all you can feasibly apply. We’re glad you are having fun with it. Yeah too bad. The flakes really look great but the underlying coat of 1 part paint/epoxy is just so thin. So no chance I could roll on a thicker top coat of epoxy, polyurethane or polyurea? Polyurea is a no go, Mike, due to the solvents in it. A water-based polyurethane or epoxy can be applied, but unfortunately you will lose many color flakes during the prep as mentioned. The only clear that can be applied without the prep is a water-based acrylic. The problem with that is it does not stand up well in a garage environment. Any solvents or gas that are spilled on it will cause it to soften and make a mess. Plus, hot tires can be a potential problem as well. Interesting. I wonder if the polyurethane option could be done via a sprayer? I’ve seen that for wood projects. That would allow for easier application. I don’t mind losing flakes either way. Any recommendations on brands? Most of what I’ve seen in the store is minwax wood type polyurethane. I’ve got a clear coat epoxy picked out if I go that route. No, polyurethane cannot be sprayed on for a floor coating. As I stated earlier, home improvement centers do not carry polyurethane for concrete floors either. I left a link for an example of where you can purchase water-based polyurethane for concrete coatings. You can find it here if you missed the previous link. Sucker for trial and error! I testing a small patch of epoxy vs. PolyUrethane (both cheap sub quality ). Think I like the PolyU better. I like the self leveling aspect of epoxy but it seems challenging to work with and we get sunlight. I worked with Epoxy for surfboards and always was frustrated with the short pot life. For the PolyU… Is there a comparison between the Legacy and SUPERCOAT brands? The tech sheets are not apples to apples in format but both appear to be 52% solids by volume. As always- your help is MUCH appreciated! Keep in mind that epoxy for surfboards is not the same formula and pot life as epoxy for floors. In terms of the two different polyurethanes you are looking at, The SuperCoat product has ratings that are more vague. However, one particular number you need to review is the Taber abrasion ratings. Abrasion ratings are exponential. A coating with a 4mg loss on a Taber Abrasion wheel vs a coating with an 8mg loss would last 3 times longer in terms of wear and not twice as long as one would assume. The SuperCoat water-based polyurethane has a rating of 33mg loss, while the Legacy Industrial product has a 10mg loss. Though the Legacy product is twice as much in cost when you break it down, it will wear at least 6 times longer. You will always get what you pay for with coatings. How would the Legacy Polyurethane compare to a clear coat epoxy (such as EpxoxyShield or Valspar)? Ideally I’d like to use both – epoxy then top it off with a coat of Legacy. Or would that be redundant? We have an article here that explains how polyurethane and epoxy compare, Mike. To be honest, it’s quite a gamble and investment to put two different clear coats over a 1-part epoxy paint. You still run the same risk of the paint peeling despite what you put on top of it. I would recommend doing either one or the other, but not both. The polyurethane is going to wear better, give you better chemical resistance, and will be U.V. stable, but you need to weigh the risk of the extra expense of it over the clear epoxy if the paint does not hold. Hello Rockin. Products like RadonSeal are basically a densifier. They help to fill open capillaries in the concrete to slow water intrusion, but they are not a sealer. The first thing you need to do before applying anything is to find out exactly how much moisture your floor expels. I suggest you read this article and purchase a few of the calcium chloride kits. You will be able to calculate how many moisture pounds of flow that your concrete expels. It it’s under 20lbs, there are special moisture vapor blocking epoxy primers that can be applied. They are made specifically for issues such as yours. Regular epoxy will not work and will peel. It will require that you give the concrete an aggressive grind before application as well. Etching is not good enough. These special epoxies need a rough and porous surface to adhere to. This product here by Legacy Industrial is an example. It’s 100% solids so it will be low in VOC’s as well. They are located in Florida and deal with these issues daily. I suggest you give them a call once you figure out how much moisture you have. Hello Joshua. Epoxy coatings for floors are much different than those used for painting metal. Marine epoxy enamel comes to mind. Sorry, but we can’t help you with a recommendation there. Yes, the urethane can be both a clear coat or color coat. Polyurethane is the actual material, but somewhere along the line painters adopted urethane for short.